Touring motorcyclists enjoy their mode of travel because they can get so much closer to their surroundings than caged-in drivers in their automobiles. This practical, well-considered guide promises to put motorcyclists in intimate contact with the vast landscape of America’s largest state, and help get them back safely to home base. Alaska is a different world from its lower 48 siblings, the authors note, and two-wheeled explorations of a potentially harsh and unforgiving frontier pose unique challenges while also being generous with rewards. This quick-access guide, sized to slip easily from a tankbag when on the side of a muddy logging road, is actually a well-engineered survival kit that addresses must-know Q&A issues. It has a durable cover, heavy, slick pages that can handle the mud and rain, and rounded corners that minimize dog-earring. The two-man team responsible for the book is an ideal pairing. Lee Klancher, a book publisher with twenty-plus years of journalism experience, handled the writing and many of the truly spectacular color photographs. 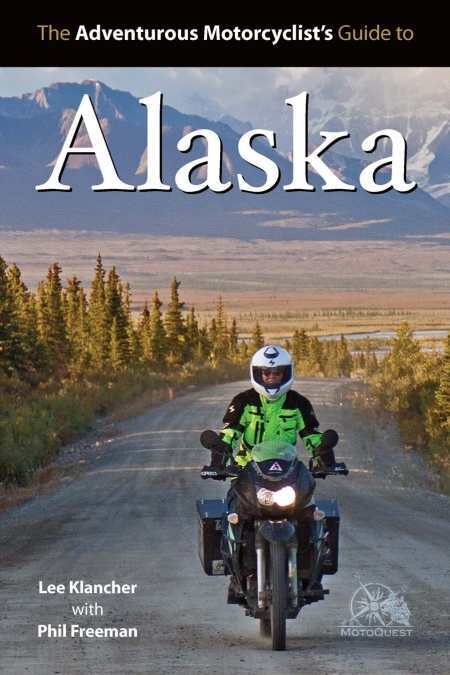 The navigator and man with the map was Phil Freeman, owner of MotoQuest, an Alaska-based motorcycle tour guide company. Freeman knows his roads. The two explain in an entertaining style how to traverse these roads safely but with swagger. The book is a great insider’s guide. How else would an out-of-state biker ever find out about Dawson City’s Sourdough Saloon and its infamous Sourtoe Cocktail? “A drink with a dead guy’s toe in your glass. If the toe touches your lips as you drink, they put your name on the registry.” Cheers!